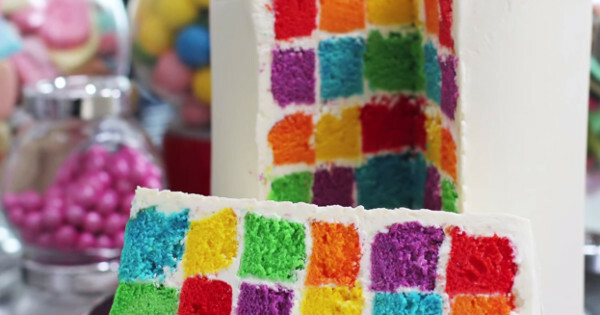 How to make a rainbow checkerboard cake - it's easier than you think! 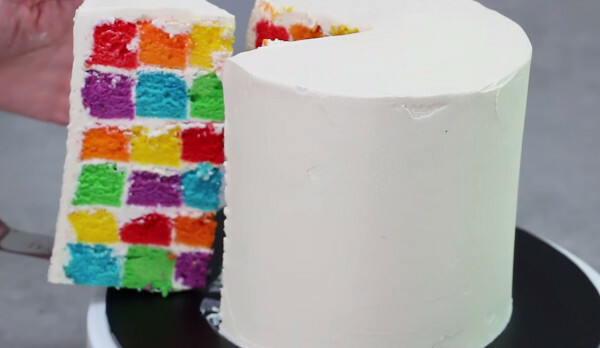 How to make a rainbow checkerboard cake – it’s easier than you think! This cake looks complicated, doesn’t it? Like, I’ll-never-be-able-to-make-this-in-my-wildest-baking-dreams complicated. But in all honesty, it’s not. And it’s a great one to make with the kids, because they’ll never guess just how it’s going to turn out. Click through to watch the video on how to create this delicious rainbow masterpiece. This is most certainly what I’d love to find at the end of a rainbow. Created by the very tasty My Cupcake Addiction, the Rainbow Checkerboard Cake uses the traditional method of making a checkerboard cake – but it’s so much more fun! With its unassuming, albeit soaring, exterior, this cake is perfect for a bright birthday party, or a rainy afternoon project with the kids. Here’s how to make this plate full of colourful fun, and if you’re completely enamoured by all that glorious colour, then check out our roundup of all things rainbow.